By now you’ve heard about the content marketing revolution, but content without context will not generate new students for your graduate programs. 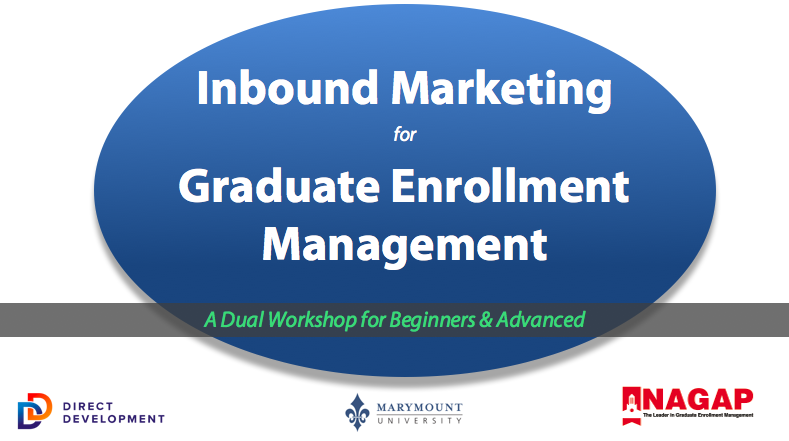 This dual workshop begins with an introduction to the 4 stages of inbound methodology for graduate school marketing, and how they are used to attract and convert new prospects through your web-based content. The second part of this workshop dives into advanced inbound marketing tactics involving case-study examples of effective blogging, social media, premium content, landing pages, and email workflows. This presentation slide deck will uncover how to develop the right content for each of the 3 stages of the Applicant Journey(awareness, consideration, and decision), with live examples from Marymount University.